I have been playing an instrument since the 4th grade (cello) and, as I learned more about how music works, was slowly able to pick-up a greater variety instruments with an increasing degree of ease. In high school, I decided to pick-up the guitar just to "have fun and rock out". I joined a band, played in the high school orchestra, joined the high school jazz band and began to practice songwriting and cover songs. Still, it was not until after I took my first class on music theory that I knew how much I not only loved the thrill of playing music but the discovery of how it worked. With this experience I can show you or your child why learning an instrument can be not only an exciting experience but an interesting and enthralling one as well. Non-profit organization that teaches elementary school children how to play as a rock band and prepares them for a performance at their school. Teach private music lessons on a variety of instruments. Taught private music lessons on a variety of instruments. Taught a self-created and self-promoted after school program. Taught music, improvisation and how to play as a group/band. 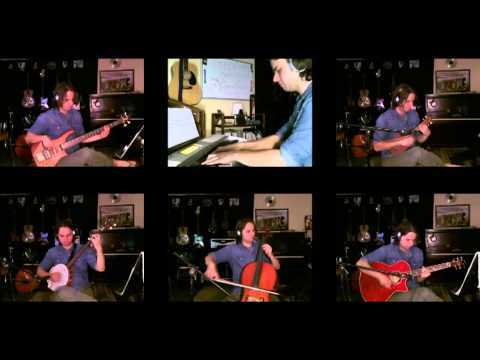 Condensed Original Song called "Lotus Pedals" featuring myself playing a variety of instruments I teach. Enjoy! 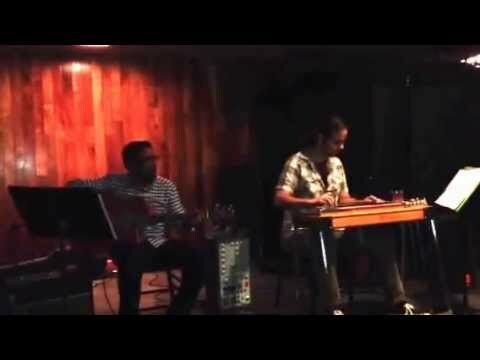 Me (on Pedal Steel Guitar) and a friend (On Guitar) performing at a restaurant. has an excellent teaching approach and a very good balance in presenting interesting music that is well suited to my level.i am very pleased and encouraged to keep practising. He did great with my 9 yo daughter! It was quite an interesting one for my kids especially those playing the piano for the first time. He is such an experience and patient teacher and I highly recommend him to any beginner who is interested in playing the piano. The lesson went very well. My daughter was able to play the basic keys of the piano as she was instructed. I hope she should be able to play better at the end of this lesson. Jared is a very patient teacher and I do recommend him anytime. The lesson was very simple to understand. Hopefully as my son continue to practice and learn every week, he should be able to play the piano very well. Jared is an awesome teacher. My son took lessons from him for about 2-1/2 years. He was always very willing to work with us if we needed to change lesson dates, reschedule, etc. My son is 17 now and really enjoyed the classes he took with Jared. If you are looking for a cello teacher, Jared is the one to choose. We recently quit the lessons as my son is 17 and has lost interest in the cello. If he decides to pick it back up, we will be contacting Jared. My son and I started this lessons and it has being a wonderful experience and we both are able to read and play the music notes. He is a very patient teacher and I highly recommend him for all ages. My son has been taking cello lessons with Jared for almost two years and my son very much enjoys his lessons and he is learning so much. Jared keeps me informed about my son's progress and he is always encouraging my son with regard to his music. As a mom paying for lessons I can not ask for more. I can't say enough about how fantastic of a teacher Jared is. He is constantly challenging my son and really helping him to read music ( my son has been playing the uke for a year now in school but really had just been copying what his previous teacher did instead of reading the music). Jared is extremely patient and is so thoughtful about his lesson plans, really introducing music my son is really interested in. I know we had been hesitant about doing online lessons because it sounds like such a foreign concept, but we couldn't be happier. I highly recommend Jared. Jared is awesome! He is very knowledgable, thorough and patient. Can't wait for my next lesson! Jared is a fantastic instructor. We were a little anxious about doing online music classes, but this is amazing. Jared is very patient and obviously knows how to teach music. I was impressed how well the online lesson went. My 11 year old thinks he's the coolest! Jared is very patient and good with young students. Fantastic first lesson! Jared is very patient. Very flexible with scheduling concerns. My daughter really enjoys her lessons so far! Jared as really made a positive contribution to my son's music education. First, let me say that he is very professional in his work ethic. He is always on time, plans the lessons; and when I asked for an evaluation for how my son's lessons were progressing he gave me a well thought out and thoughtful report. My son enjoys his lessons and appreciates the way that Jared talks to him when he is giving instructions and suggestions. I feel my money is being well spent on my son's lessons. Jared is my son's first teacher after taking a year break from the cello after a very bad year long experience with a cello teacher at a music store--where my money and son's time was totally wasted. The lesson I learned from that experience was that when looking for a teacher find one that cares about what the student is learning and their goals; rather then the teacher's resume with regard to their educational background and not really caring about the student. I feel Jared is trying to make sure that my son learns and enjoys the cello. My son is 13 years old; and as a thirteen year old boy he sometimes needs to be reminded to stay focused and Jared speaks to him respectfully to stay on point. (I should say my son likes to think he is funny at times). My son also likes taking his lesson online. I would definitely recommend Jared as a cello teacher. I'm a beginner. Jared is very patient and takes his time to make sure that I understand, which is very much appreciated. Fun, too! First lesson went really well! So excited to get started! Great teacher!! We are already seeing tons of progress. Easy to work with and great with young adults. My 15 year old son has just started lessons with Jared. Had a couple of scheduling issues and Jared was more than willing to accommodate us. My son seems to enjoy the classes with him. Wasn't sure about the online lessons at first, but it's like they are in the room with you. So works really well for us. Jared is great! He's very professional, and knows his stuff. He started me at my level, and was super patient with me. Highly recommended! Good teacher, very attentive and positive. He knows how to use Skype to provide online lessons seamlessly - no different than taking a lesson in person. I took banjo lessons from Jared for about a year, and can't leave without sharing what a great teacher he is. I had only planned to take a lesson or two, to help me get started. But I learned so much from him every single time, I just couldn't stop! He's very knowledgeable, shares stories and background as well as music theory and techniques, he's friendly and fun, very professional and very patient. In short, I learned a LOT and had fun doing it, what more could you ask for? Very prompt for lesson time. Very friendly and helpful. Knows his music well and works well online. My lesson with Jared held great communication, positive feed back when I made a mistake, and helpful corrections. Awesome! Jared is an amazing teacher! Very interactive and learned a lot quickly. First class and my son is very enthusiastic! My 13 year old son loves his lessons with Jared. He looks forward to it every week, and is showing a lot of progress. Jared manages the technology well, and makes online lessons as effective as in-person. Jared is great! Patient, knowledgeable, but also doesn't waste time, which was important for me when you are taking just 30 minute lessons. Really enjoy my lessons with him! Jared has such terrific enthusiasm, and brings that to each lesson. He really pushed my daughter to try new music types she wouldn't have normally looked at, yet enjoyed playing. Highly recommend him! I bought a ukulele and tried to teach myself at first but was not very successful. I got a couple of lessons as a Christmas gift and now I can actually play! Jared is a great teacher and can help you with any problems you are having even through the Skype lessons. I'm not going to lie, I was a little apprehensive about taking online lessons at first but I'm really glad I got a chance to take them with Jared, I would highly recommend it to any beginners out there! This is our first experience with online music lessons. We choose Jared because of the reviews he received from his other students. They were not wrong! Jared is great! He is always on time. He communicates very well. He makes our daughter feel comfortable. He even took the time to write a cello piece for a current Maroon 5 song at our daughter's request. You will not be disappointed if you choose Jared. My name is Michelle. As of right now, I have taken cello lessons with Jared about four times. He is an excellent teacher, very patient and understanding, very knowledgeable and can answer almost any questions you may have regarding the cello and music. He also works very hard to try and teach you the song you are most interested in learning which makes any session fun! Most importantly, I am always learning something new and feel like I am always progressing with my skill on the cello. Jared has been helping my 14-year old daughter become passionate about playing cello again. My daughter had taken years of conventional school lessons and had all but given up due to boredom and monotony. She has only had a couple of lesson from Jared but so far, so good. Even the tone in my daughter's voice regarding her cello has improved so much. She sounds excited and proud regarding playing and I am so glad! Jared's lessons have greatly improved my sight reading and overall general knowledge of music. I like how he plays along with me and is always supportive and patient. Highly recommend him, a great teacher for kids. So, Jared is a one-of-a kind person who is able to tailor his craft to you. He is observant and watches you carefully, "tuning" his coaching to exactly what you need, when you need it. He is affable and easy to learn from. As if that isn't enough, he is - hands down - an excellent musician. He is a pioneer, willing to stretch to use technology to make things work for his students. Recently we managed a Bossa duet (guitar and cello) via Skype. He is exceptional and has my highest recommendation. Great teacher - he keeps me on track and works at my level. I wanted to learn 2 specific songs and that is what he is teaching me, plus more. ;-) Very friendly. I came to Jared with no knowledge of the tenor banjo at all. After a handful of lessons, I am able to make my way around the fret board and play some tunes. His knowledge of music is really impressive, and he is obviously invested in being a great teacher. I highly recommend taking lessons with Jared. You will learn! I am really glad that i take the online classes for Ukulele with Jared. At first i wasn't sure if it's going to work out taking music class online. Turns out it really works well, as Jared is a really great teacher who is patient and well knowledgeable instructor. He's also great for accommodating my schedules. He's helped me make great progress. Strongly recommended! Jared is an excellent accordion teacher. I am new to the instrument and he has been extremely patient, kind, and easy to work with. I highly recommend him! I've been taking banjo lessons from Jared for almost two months. He's pleasant and professional, explains himself well, really listens when I have a question, knows a lot about music and a wide variety of instruments, and seems to be one of those people who's just born with the music in them. You can tell he's really enjoying himself. But the thing I like the most is the progress I'm making -- less than two months and I can already play several simple songs. I tried teaching myself, couldn't do it. I recommend him highly to anyone who wants to play a new instrument or improve on an existing one, he's awesome! Jared teaches my 14 year old son banjo over Skype (we live in Africa). He searches out whatever my son wishes to play, from Star Wars music to Irish songs. My son loves his lessons and is motivated to practice so Jared is obviously doing things right. Jared finds where you are skill wise and teaches you from there. I know some basic music theory but there are many holes in my knowledge - He is very good at figuring out exactly what I know and what I need to practice still so I feel accomplished at the end of every lesson and don't waste any time getting to know my instrument. I highly recommend taking lessons with Jared. I'm having a blast! Jared is a perfect teacher! He is patient, nice, accommodating and never scolds when you dont get practice in. He nicely just trys to get you back on track with what you have done at that point and moves you forward at the same time. He is interested in what you want.. moves at your speed yet pushes you a little and he genuinely listens to you when you talk. He is open and will share experiences also from his life to help you and make learning fun. Jared has been teaching my 11 year old son Guitar and for almost 2 years now. Watching him in action and seeing how much my son loved it, inspired me to pick up the Bass Guitar and have Jared teach me as well. Jared has a wonderful way of making the entire experience both fun and rewarding. He has a wonderful way of communicating with my son and keeps his interest while they learn. I couldn't speak more highly of Jared and would highly recommend him as an instructor to anyone of any age, he's simply fantastic! I had no prior musical experience and Jared is excellent at catering to my background while still pushing me with weekly exercises and songs to practice. He makes sure we cover subjects I'm interested in and works out many songs I request to learn as our lesson for the day. He has a wide range of knowledge and is super flexible with scheduling and communication. I'd recommend him to anyone wanting to learn more about their instrument and I look forward to taking more lessons from him! I've been taking Cello lesson for a few months and I have to say I don't regret my choice of picking Jared for teacher. He's an easy going & fun teacher. He's also very patient, it's perfect for a beginner. I've been taking cello and ukelele lessons from Jared and I could not recommend him more highly. Not only is he incredibly patient and supportive, but he's got a fun, easy-going demeanor. He's so knowledgeable and passionate about music that he's really able to incorporate that into his lessons and tailor them to music that I'm interested in. He's very encouraging and pushes me beyond what I think I'm capable of doing. I could not be happier with my lessons. I very much recommend Jared to anybody of any age or ability. I've been studying with Jared for about half a year now and its been a really enjoyable experience. Jared sets a pace of learning that suits me very well. He's able to distill a large amount of information in a simple and easy to understand way. I appreciate that he some how knows how much to push me so that I can really put into practice what he just explained to me. I highly recommend Jared if your looking for a music teacher. My cello lessons with Jared are great! I always look forward to them. He's very patient and encouraging, and he's really good at listening to my specific music goals and tailoring lessons to help me :) I really appreciate it. Thank you! Jarrod is very patient, easy going and a born teacher. I am very shy and self conscious, he is easy to be around so I am able to relax and learn. Jarrod knows when to change tack and how to get you to push your self a little further. He really is an excellent teacher I would not want anyone else. I would recommend to anyone. when my son is ready I want Jarrod to be his teacher. Jared is a VERY patient teacher. I had played the cello when i was younger for a year but i hated my music teacher so i was afraid it would turn out to be the same. I was wrong because from the start he helped me select a cello and has since then been very helpful and nice. Jared is an easy going & fun teacher who is very open to changing tack on a sixpence should you suddenly need/decide to change direction in what you're learning. I wouldn't use anyone else!!! Jared is a multi instrumentalist, and even with ukulele not being his primary instrument, he's very knowledgeable. He and I have had a lot of fun working out arrangements and he's even taken recordings I've sent him and figured out the chord progressions for me! He pushes me to learn new strumming patters and try some finger picking, but the lessons are a great balance of learning and getting better while still keeping it light. Jared came to house over the span of year to complete my lessons. I have a very erratic schedule, but Jared communicates easily and we were always able to find a good time for lessons. I didn't really know what direction I wanted my musical education to go, and Jared was very sensitive to that. We started with basic exercises, and worked up to basic and intermediate music theory, until we reached the point where I was writing songs on my own. He even showed me a few different methods of songwriting. All in all, I had a great time. Would def recommend! Excellent teacher in every way possible! that enthusiasm is motivational for the student. I look forward to my lessons each week. I am a total novice to the guitar and an thoroughly enjoying my lessons with Jared. He understands my frustrations and allows me to "get it" even if it may take longer than would be expected. I started my lessons for the bass guitar with a solid week with him, 1 lesson a day for 5 days. After that I have continued with a once a week program. The bottom line for me is I wanted to do this for fun and personal entertainment value and I am certainly getting both. Jared is quite shilled and has a great easy-going attitude that is perfect for my learning curve. I would highly recommend him to anyone wanting to learn for the first time and would truly expect him to help anyone with even advanced skills. Very Pleased. Hi,We thought Jared was good. He arrived on time, was polite and informative. I had already explained to office that we were really wanting a vocal coach and guitar in the same instructor, so we were giving Jared an opportunity. He was so nice! But not what we need. He would be good for any student considering guitar and music theory. Thanks!